Questions, concerns, doubts about where in Spain, to study, which school to select, what Spanish program is right for you? We can help! Our experienced staff are happy to help you choose the right program. You can contact us by email, by chat, via telephone, or on Skype. We also offer a small questionnaire to tell us your preferences and question. Our team will respond to you with personalized help. Like to discover and decide on your own? We have several comparison and information tools to help you choose your perfect program. 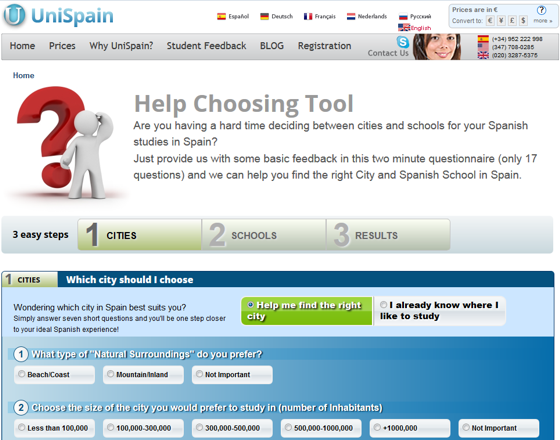 If you're having a hard time deciding between cities and Spanish schools for your studies in Spain, this tool will help you make a well-informed decision. Simply answer 8 short questions regarding to the city (such as the importance to you of size, weather, culture) and 9 questions regarding to your preferences related to the Spanish school and you'll be one step closer to your ideal Spanish experience! Our detailed tool that lets you compare multiple schools and cities. You can factor in your accomodation needs, set a maximum price, select a course duration. In the UniSpain blog you can find a number of useful posts that can help you choose the right Spanish course. 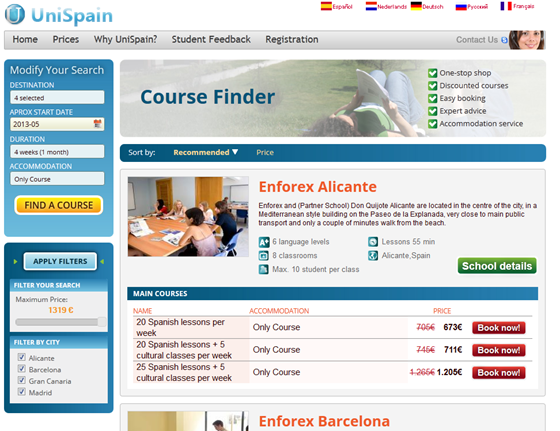 Take a look at the category Spanish schools in Spain where you can find articles like the Top 5 best Spanish schools in Spain or the Top 5 cheapest Spanish schools in Spain or take a look at the posts that are tagged Useful Information where you can find Help Choosing the Right Course or City. If any of your questions regarding cities, courses, schools or accommodation are still unresolved, please don't hesitate to fill out the contact form below and one of our experienced advisors will get back to you within 1 to 2 business days. Any school you are specially interested?